Peter Gordon's Blog: What goes up? I enjoyed Joe Studwell's How Asia Works: Success and Failure in the World's Most Dynamic Region. The author notes (p. 267), "The historical review of east Asian economic development shows that the recipe for success has been as simple as one, two three: household farming [land reform], export-oriented manufacturing and closely controlled finance that supports these two sectors." He attacks western economists who (seemingly) push the "Washington consensus" view that Studwell disdains. The author makes his case by carefully describing the post WW II experiences of Japan, Korea, Taiwan and China. Thailand, the Philippines and Indonesia did not or could not execute one-two-three. North Korea, Cambodia, Myanmar and Vietnam would merit another book. Is one-two-three the "Take-off" of W.W. Rostow's famous Stages of Development? Studwell seemingly thinks so. I am clearly not an Asia expert, but I have two questions. The first comes from Econ 101, "At what cost?" For the case of China, the answer boggles the mind. The second question comes from Tom Sowell. He suggests "And then what?" This weekend's WSJ includes Josef Joffe's "China's Coming Slowdown: History shows that every economic miracle loses its magic. 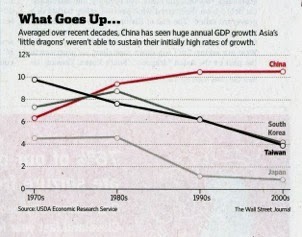 How much longer can China sustain such astounding growth"? Post-1980s Japan offers one lesson. Here is Joffe's summary of what the others have done. You have to wish them well. But a betting man would look at the record.